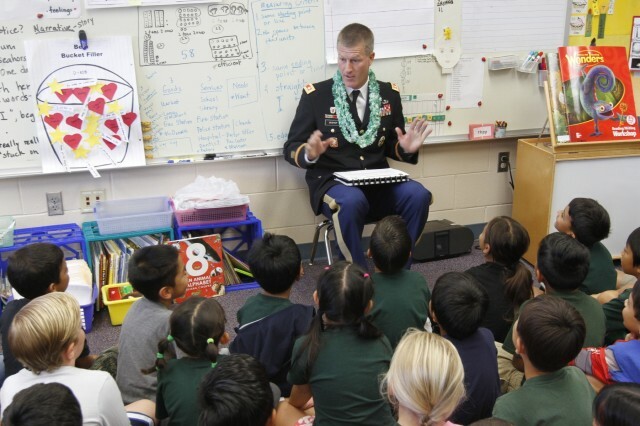 MILILANI, Hawaii - When Soldiers have the opportunity to make an impact on the lives of those they serve, they see it as a privilege and honor. 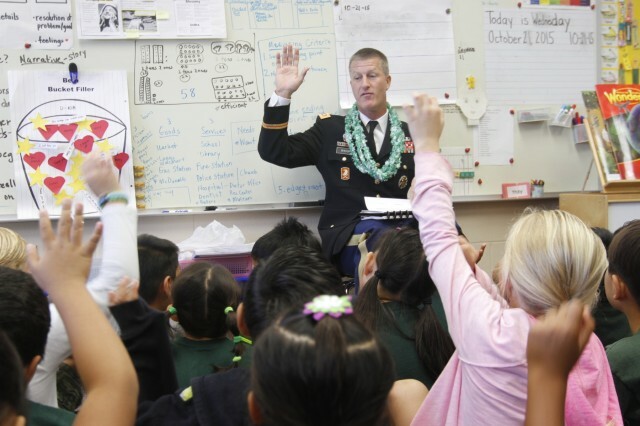 Being a volunteer is the very core of how the Army is staffed. It is also a way for Soldiers to give back to and take care of their host community. It is a way for them to show both the American people and those countries abroad the commitment the Army has to those it serves, even during peacetime. For Lt. Col. Dustin Bishop, the 8th Theater Sustainment Command information technology officer, volunteering at his children's school is one way he can help shape the future of the country. That is why he felt honored when he was asked to be a volunteer speaker during their College and Career Readiness Week. 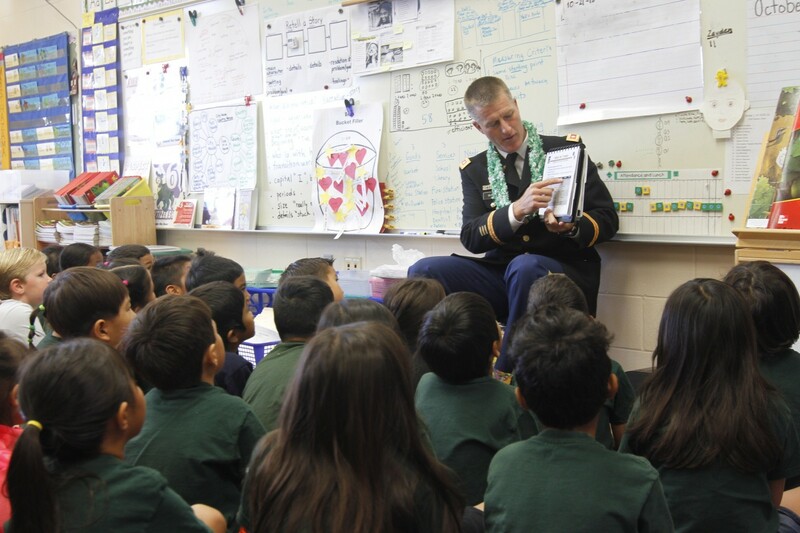 On Oct. 21, Bishop spared no expense as he dressed up in his Army Service Uniform for the first graders at Mililani 'Ike Elementary School, here, to tell them some of the most important things he believes they can do to succeed now and in the future. "This is where our future leaders are being shaped," said Bishop. "It's the most efficient way to inject your experiences and wisdom in a meaningful way. The kids tend to connect with those they have most in common. Bringing in a famous NFL player to speak on such topics is fun and exciting, but does it really resonate over time the way mothers and fathers from the community do?" He sat in a tiny chair, even after being offered a full-size chair. He sat in front of the children with his son, Dietrich, front and center. He was on their level. The children were quiet and watched him as he spoke in a manner that they could understand. "The very same values I learned in first grade are the values that I live by today," said Bishop. "Now I work with technology in the Army. I manage resources like people, equipment, time and money. I get to work with amazing people, from all backgrounds, who teach me something new every day." While talking to the students, he explained how their school's Six Pillars of Character are nested into the seven Army values. "Children are never too young to plant the seeds of success," said Bishop. "If we immerse children in an environment where choosing higher education and setting goals toward establishing careers seems normal, they stand a far greater chance of successfully navigating the perils of teenage years, and finding themselves on glide paths envisioned years earlier." As his visit to the classroom ended, he asked the children if they knew what their next goal was and they shouted, "To finish our homework!" He laughed and said, "That is a great goal! I was thinking more along the lines of making it to the second grade." The children grew excited and a few children whispered, "Yeah!" "I felt both privileged and fortunate to be asked to speak at this event," said Bishop. "Privileged to serve in such a professional organization that makes it so easy to dedicate my life's work to, and fortunate to serve a public that holds its public servants in such high regard."